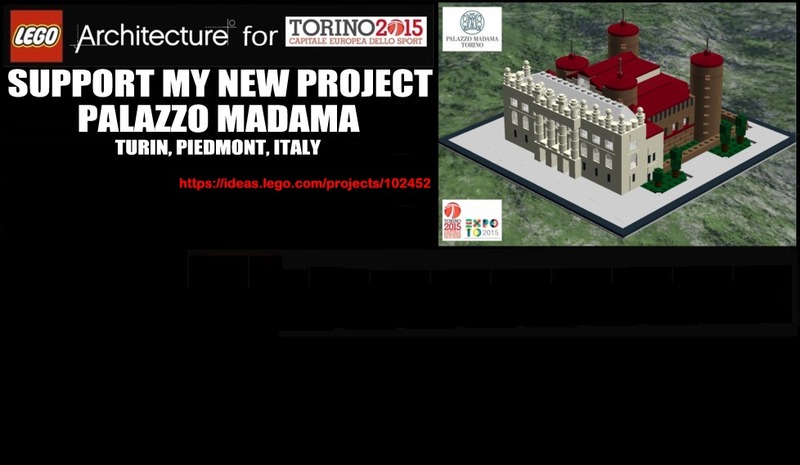 LEGO Architecture Palazzo Madama (Turin 2015 – European Sports Capital, Italy) | Il Blog di Luca C.
This is my project for LEGO Architecture for Turin 2015 European Sports Capital. Palazzo Madama, standing in the centre of Piazza Castello, is one of the symbols of Turin. It’s the first of a series of projects which could be sold during the event “TURIN 2015 European Sports Capital”. I recreated the real monument in every detail ; for this reason I changed many times the photos in this project, but I finally concluded it. I invite you to compare my project with the real thing and to post a lot of comments. Please support my project! I would like to work for LEGO group, but today It’s a dream and I hope that tomorrow It will be a reality. IL NUOVO PROGETTO DI PALAZZO MADAMA (TORINO 2015 CAPITALE EUROPEA DELLO SPORT) E’ STATO APPROVATO. COLLEGATEVI SU https://ideas.lego.com/projects/102452 E CLICCATE SU SUPPORT (ACCEDETE TRAMITE FACEBOOK). SIAMO 96 SU QUESTA PAGINA FACEBOOK, SE OGNUNO DI NOI VOTA IL PROGETTO AVRA’ 96 VOTI. DIFFONDETE, DIFFONDETE E SOPRATTUTTO FATE VOTARE!